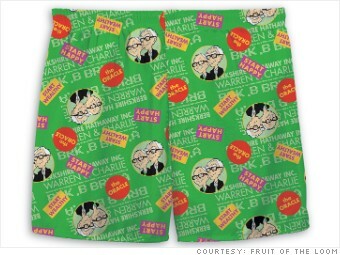 Would you buy underwear with Warren Buffett's face on it? Here's a look at some of the items for sale this weekend at his company's annual meeting, aka 'Woodstock for capitalists'. How much would you pay to have Warren Buffett cover your rear? Shareholders in Buffett's company, Berkshire Hathaway (BRKA), will be offered a variety of Buffett-branded merchandise at the annual shareholder meeting this weekend in Omaha, including underwear. For the second year in a row, shareholders will be able to gird their loins with boxer shorts featuring the sage of Omaha's likeness. Fruit of the Loom has doubled its inventory of the so-called "Berky Boxer" this year after the shorts sold out in a matter of hours at last year's meeting, according to a company representative. For just $6 a pop, the unisex Berky Boxer is a versatile garment. It's suitable for "loungewear, swimsuit cover-up and underwear."